Deer hunting isn’t just a hobby for some. There is so much more to deer hunting rather than just aiming and shooting at your target. From scouting and planning on which location to hunt to controlling your scent as well as your equipment, there are just so many aspects to it. And since the deer hunting season is just around the corner, I thought that it would be really helpful (and interesting) to have deer hunting experts share their top 3 hunting tips. So here is what I asked them: What are your 3 best deer hunting tips you can share based on your experience? And as the title points out, 50 of them took the effort to come up with useful insights which I listed down below. But before that, I would like to thank them for their time and passion for the deer hunting community. Others wanted to contribute as well, but they are just too caught up with their personal matters which I can relate to myself. Also, being curious myself, I did a quick summary on some of the common tips they shared. 1. Location trumps everything else. In fact, I recently told someone that the most important piece of hunting gear just might be a key…to the right gate. Without access to a place holding the size deer you’re after, nothing else matters much. 2. Patience is overlooked as a deer-hunting skill, but it’s critical. No matter how well you scout or choose your stand on a given day, the odds don’t favor getting a crack at a trophy buck right off the bat. How well you handle the wait for him to show up often is the difference between success and failure. 3. Justified confidence in your gun or bow and your ability to shoot it is where the rubber ultimately meets the road. Some hunters wait forever for a crack at a trophy buck, then suffer a Chernobyl-level meltdown when he walks out. There’s no guaranteed protection against buck fever, but knowing you have good gear and knowing you can operate it sure helps. 1. How you enter and exit your stand sites is the most critical aspect tied to overall success. Intimately learn the topography — know where the bedding areas are — and learn how to get to and from your stands without spooking deer. 2. Don’t hunt a stand if the wind isn’t right. That’s a tough call for many hunters. If the wind is blowing your scent into a bedding area or an area where deer are likely to appear, it will defeat you nearly every time. Plan your stand setups that you have options. 3. When it comes to tree stands, wind placement, camouflage and background cover are way more important than how high the stand is hung. Also, the less you trim for “shooting lanes,” the better. Spend time in summer analyzing everything, and place the stand in a spot that maximizes all of these factors. Deer are very conditionable critters. They rapidly learn to avoid threats and ignore unthreatening events. For example in areas where deer don’t often hear a vehicle they usually run from them. In other areas such as farms or neighborhoods were vehicles are common deer tend to ignore them. Hunters can use this to their favor by considering the common activities for the area and try to replicate them and/or avoid doing activities that deer don’t frequently experience. For example, if you are hunting a farm ask the farmer for ride close to your stand in one of the vehicles often used there. I’ve worked on golf courses where deer ignored golf carts and the golf course manager’s truck but ran from my truck. To collect deer for research I had to use one of the course’s golf carts. I’ve worked on military bases and been at trap ranges where deer commonly fed within 50 yards of a practice range where 1,000’s of shots were being fired. The deer continued feeding and rarely lifted thier head. I’ve also watched deer run while hunting national forest and a shot was fired in the distance. Knowing what deer are conditioned to accept as unthreatenign where you hunt can give a hunter a huge advantage. 2. Food plots are great, but they also come with some downfalls. The main thing I’d stress is don’t get too comfortable sitting over a food plot every time out, it’s often a trap many of us hunters fall into, myself included. My best success has always been dropping into the cover a ways and cutting them off before they get to any food source. Not only is it easier to get out cleanly after the hunt, but there’s a much better chance to catch a buck up and moving during daylight when you are in the cover. 1. Pressure matters. The less hunting pressure and human intrusion on a property, the more mature bucks you will see. The more pressure, the more your hunting will suffer. Big bucks wont put up with too much pressure before they turn nocturnal and seemingly vanish. Remember that when trying to find places to hunt. 2. Find the feed. To survive, whitetail deer must eat multiple times each day–crops, clover, browse and the like. The more food sources on a property the more deer you will see. Keep in mind a land can have great cover, but unless there’s ample food on there, you won’t see a lot of deer. 3. Scout more than you hunt. Start right now by walking properties and identifying food sources, deer trails, old rub, creek crossings with tracks and the like. Try to set out several trail cameras on food plots and trails and monitor bucks this summer and into fall. Every day that you hunt during the season look around for signs of buck activity, like new rubs and scrapes and fresh tracks. The best hunters rely on 70% scouting and planning year-round and then 30% on their hunting skills to shoot mature bucks. Curiosity and the best of intentions ruin more deer hunts than anything else, in my opinion. Between feeders and calls and scents, we spend a lot of time, effort, and money trying to make deer do what we want and ignore basic elements of successful deer hunting in the process. Oftentimes, our simple desire to hunt overcomes good sense on how and when we should hunt. 1. Scout and hang stands any time but right before or during the season. If you’re moving stands and skulking about the woods searching for sign after it’s legal to start killing, you’re taking two steps back with each one forward. Deer notice that activity whether you believe they do or not. They can smell your trail, hear the banging, and often spot you creeping around. I’ve seen this unfold enough times to induce nausea – someone arrives on a lease in October to scout or erect a ladder stand for the first time. They get frustrated after only seeing yearlings in a few sits and move locations throughout the Fall. Come Prime Time, the place is dead. The deer are often around but adjust their routines. Though I realize rules and regulations on public lands often render this impossible, where able, make a concerted effort to place stands well before the season and have faith in their placement. As for scouting, it’s not always realistic for new properties, but I prefer burning-the-boot-leather scouting during January, February, and March when the underbrush is clear. You can learn a lot for the upcoming year, and your activities will be long-forgotten by September. Also, while I love trail cameras, it’s important to fight the urge to check them every week – digital images of antlers are not as satisfying as the real version. The models these days operate for months on the same set of batteries, and SD cards hold a ton of images, so don’t let that motivate you. Of course, cameras need to be checked or what’s the point? Just don’t overindulge. 2. Using scents and sprays sensibly. I’ve seen doe-in-estrous work. I have seen tarsal gland scents work. I believe these attractants have a place in deer hunting strategy. You just have to employ them with a light touch rather than skunk-spraying the woods. I once hunted with a guide in South Carolina that flat refused his clients to use scents because he felt they contaminated the area as the smells broke down over time and would alarm the animals. This man thought about a deer’s olfactory system more than any I’ve met. With a season that runs from August to January, he was ultra-careful about keeping stand sites relatively clean for the next clients. He acknowledged the utility of scent lures but doubted the capability of newbies to restrain themselves from having deer urine dripping like dew from the pine needles. If you choose to use scents, the guide’s train of thought was to keep them contained so you can remove them when leaving a hunting area. For instance, using otherwise-clean sponges sprayed with scents clipped to trees. Once finished, place them in a plastic baggy for the next time. Don’t hose down the base of stand or tree branches or whatever. In all honesty, I rarely use scent lures any more. I prefer to keep the woods smelling as natural as possible; however, I know lure scents can work, but I definitely recommend moderation. Note: You might want to check out some great hoodies for hunting. See more here. 3. Don’t hunt a poor wind. This is the Golden Rule of Deer Hunting. I realize opportunities to get away to sit in a stand is limited for many hunters, and Mother Nature is often a cruel enemy, but don’t waste your precious hours battling a losing situation. Many try to keep a stiff upper lip and fight through a wind blowing in the wrong direction hoping their scent-killing spray will come through. Not saying some in the Heartland haven’t killed deer with the breeze on their necks gusting right to a buck’s nostrils, but 99% of the time, it’s game over. Worse than a steady wind coming from the wrong direction is the swirling wind. If you hunt creek bottoms, swamps, or oak hammocks, you know how a hard wind can cyclone the branches in every direction. If this is happening, it’s time to bail on that location in search of a better set-up. The biggest buck I’ve shot came after days of waiting for a perfectly still morning so I could slip into a bottom adjoining a peanut field. We knew the big bucks hung out down there and did everything to keep from tampering with the site. When the time came, I was in the stand less than 20 minutes when the West Georgia stud cruised nearly directly underneath me. Don’t let anxiousness to hunt kill your honey-hole when the conditions are less-than-ideal. If you’re asking a Kentucky Hunting Outfitter what would be the 3 best hunting tips, I’m going to answer that based upon 95% of the people reading this having more than a little experience in the woods. #1) Use the information you already have in your head! So many hunters know what they are supposed to do, but they don’t apply it to their hunt. #2) This pretty much coincides with #1, but most people go out of their way to be scent free. If I had to guess, 95%+ of all hunters do not use scent free oil on their guns. They all know better, but don’t use it anyway. Look at it like this as far as the deer smelling you; it’s the difference between a subtle squeaking fart and room clearing monster of a fart that can be smelled by all! #3) This is my hunting expertise and my “thing”, but spend an hour stalking/creeping getting to your hunting spot. Take 1, 2 or 3 super quiet steps and wait. Look. Scan. Make sure there isn’t a deer in site. Look at your path, see what direction you have to go that makes the least amount of noise, and take a few more steps. If it’s dry with leaves, you’re pretty much wasting your time trying this. If it’s moist, wet, or raining you are golden! I’ve shot many trophy bucks doing this. 1. “Missing link” – Coming out of the winter, the deer are deprived. They need vits and Minerals as soon as they come out of the winter. If you have a mineral out there like Blaze or Glory they will hold on the property that you hunt because they need that mineral for the spring to replenish before the next fall. 2. “Variety” – Deer need variety in their diet. By planting products that are favorable towards the deer in the summer they will be happy. Make sure that you provide tall growing cover like upland/turkey blend. This food plot variety is great for providing cover and food in short time and the deer will forage there right until the snow starts to fly. 3. “Use the WIND” – don’t hunt an area in the fall that has a wind blowing into where the deer are going to be coming from. You have spent the whole summer preparing for this hunt, take the time to wait for the right wind. Deer’s best friend is its nose, so use the wind to mess with him. Hunt the right wind after using the right products and before you hunt, pour out some Rack Stacker Entice to increase your odds of harvest. 1. Hunt all day, dark to dark. Don’t come out for breaks. 2. Never hunt an entire farm in a season. Hunt half, and manage the other half as internal refuges or sanctuaries, then you won’t push the best mature bucks off your farm. The best bedding areas are the sanctuaries. 3. Only hunt a tree stand in the best wind, if the wind changes, move to a stand where that new wind is best. With shifting winds, if you can’t keep your scent out of the bedding area you are hunting, then just leave. Although you asked for the top three Best deer hunting tips, I am going to provide you with the four P’s of hunting for any wild game. If you follow this tried and true method you will be successful no matter what you are hunting. 1. Planning: Gathering all your gear in advance, maintaining your equipment and proper scouting of the area all year round are a must to have a successful hunting season. Proper scouting will provide you with everything you need to know about the animal you are hunting and help put you in place to make that shot. 2. Practice: You would be surprised at the number of hunters that don’t touch their bow or rifle till hunting season. Knowing the limitations of your weapon of choice are a must! It takes a lot of range time to become a master of your craft. Practicing from multiple angles, elevations, and situations will always make you a better hunter. When it comes time to make that shot and the pressure is on, this could make or break your season! 3. Persistence: We call it hunting and not catching for a reason. Animals won’t just fall into your lap. You can’t just go out once and expect to bring home a deer. You persistently need to pursue your game. You most likely won’t come home a winner every time, But you have to put in the time in the field to be successful. 4. Patience: We all know that sitting for hours on end is no fun. Scouting can help alleviate you of some of this sitting, but you still need to be in the field to get the deer. Calling it quits early before that big buck or fat doe walks your way will never bring home dinner. Spend the time enjoying nature and you will be a success. If you like to fight the heat and the bugs of the early archery season then pre season scouting is a must. With most, if not all of the summer foliage still in place, visibility is limited. Trail cams are your best bet. The most common mistake made by hunters using trail cams that must be visited to be checked is that they do not go to the cameras in “hunt ready” mode. Always prepare your clothing and gear as if you are hunting when checking your cameras. There is no need to educate your bucks before the season even starts. One of the biggest mistakes made by both archery and firearm deer hunters is that they do not practice all year. The more you shoot, the better shot you become. I know dozens of guys that shoot a hundred arrows a week all summer getting ready to hunt in the fall. But when the season starts they stop shooting. Shoot every chance you get all the way through the season. As I do seminars across the country each year one of the most common questions is, “What is your favorite part of the season.” For me the later the better. My best big buck hunting comes after Christmas almost every year. The rut is over, winter is looming and food is all that is a on a mature buck’s mind. To survive winter he must replenish the fat he lost during the rut. Bucks are as easy to pattern in January as they are in October. Food sources are the key to success. Hunt late in the season and hunt all day. 6. Use a calibre of rifle suitable to the body size of the hunter. Hunters using a calibre too big for their body size often tend to pull to one side or shoot over the animal. 1. Get off the field edges, and into the timber. Most hunters hunt field edges/ food plots because they can see a long distance, and have an easier job of trimming stands. Get into the timber, downwind of where you would normally hunt. This will give you a much better chance of seeing a mature buck during daylight. Big bucks don’t get big by walking around in the open during daylight very often. 2. If you do a-lot of calling; AKA, rattling antlers, can calls, grunts, and wheezes; STOP! Big mature deer won’t usually come into aggressive calling because if they did – they wouldn’t have survived to become mature. Instead, try (1) grunt every 20/30 minutes. When it comes to calling, less is more. 3. Never be hesitant to move in on areas you see a-lot of deer activity. I run and gun with a Lone Wolf hang on and sticks, and it has been the demise of more big bucks than any other tactic I use. By sneaking into an area, setting up, and hunting right on the spot – you can have the element of surprise! It works, try it! 1. Scout Now! Start your scouting missions between July 4-10. Over the course of the next 6 weeks you’ll be amazed at how many bulls and bucks you actually see. When in velvet, these animals hang out in the open, as they don’t want to damage their racks. It’s common to see more bucks in a day of summer scouting than you’ll see the entire season. 2. Run Trail Cameras: The best way to cover ground when you’re not there is with trail cameras. Start them now and keep them up all season long, it’s humbling what you’ll learn from them! 3. Be Prepared: Be mentally and physically ready to hunt. 80% of hunters are overweight, which greatly cuts down on where they can actually hunt out West, where the country is big and rugged. Start working out now. Get a good cardio and core workout routine, and eat a good diet, and you’ll increase the odds of filling a tag. Note: Click here to read more about the best waterproof gloves which are really helpful for hunting. 1. Know how to use topo maps: A topographical map gives a picture of an area, and using one is one of the best ways to get to know an area. Pay attention to streams and wetlands areas. In general, the best place to find a trophy buck is the last place you’d want to pack it out! 2. Scouting: Do pre-season scouting to locate productive hunting areas. Know what deer sign looks like, and locate natural funnels and trails. Get an idea of where the wind might come from at different times of the day. Find watering locations and where the animals feed, and when. If you’re hunting public land, figure out where the deer might go if they’re pressured by other hunters. 3. Gear up: You spend a lot of time and money hunting – so don’t scrimp on your gear. Get appropriate clothing, boots and rain gear. There is no such thing as bad weather – just inappropriate dressing. Get a good, usable hunting knife – it may be your only tool when that buck is down. Avoid gimmicky field dressing tools. Have a plan for hauling out the animal, and don’t overestimate your physical conditioning. When it comes to deer hunting I believe there is nothing more valuable than pre-season scouting. Whether you are hunting a new property or an old favorite, scouting is equally important. On a new property the benefits are obvious. In order to know how the deer are moving throughout the new property you need to get boots on the ground. On an old property realize that things change and deer may be using the property differently than in years past. If you are targeting mature bucks the key is to find their preferred bedding. Once you have a good idea where the bucks are bedding, look for tree stand locations that allow you to sit just outside of the bedding area on the trails the buck is using to access food or during the rut, doe bedding areas. But, as you can see, you would never be able to find these areas without pre-season scouting. I believe we all get somewhat caught up in the trap of being super excited opening weekend and for the first few sits of the year. But, as the season progresses we start to let the thoughts of not filling a tag creep into our mind. When this happens we begin to slack off on our scent control, walk loudly to our stand and don’t pay attention when we do get to our stand. Deer hunting, like any other sport, is more mental than physical. When the season is a month old and these thoughts start to creep in, remember that it only takes one second to change your season, but that it will only happen if you stay in the moment. Trust in your preparation and hard work during the off-season and stay positive. In the end it will make all the difference whether you are successful or not. Again, staying on the theme of hunting being more of a mental sport than a physical sport, it is important that you keep an open mine while sitting in the stand and realize that there is always something you can learn. Analyze every encounter you have with a deer. Where did they come from, what time was it, what was the wind doing, why are they moving. Eventually, you will be able to put all these small pieces together into a clearer picture of where a better stand location may be. A lot of the time the information gained by doing this is not easily seen on the surface with an aerial map or even boots on the ground scouting. This “inside information” can be extremely important for those who hunt public land. Let every morning or evening on the stand be a learning experience. 1. Scent Control – Keeping down the human odor is number one for me. Scent free soaps, scent free laundry detergents and storage of hunting clothing away from daily household odors and campfires is a must. Deer have an exceptional sense of smell and can recognize a scent that is not part of their daily environment. Wind can be a friend or foe when it comes to odor. Try not to hunt feeding areas or heavily traveled deer trails when the wind is pushing your scent into them. Hunt where the wind is in your favor, pushing your scent away from them. 2. Be Undetectable – Don’t walk across open fields or down a path that the deer use to get to your stand or blind. Find a way to your stand where you can be the least detected and are not crossing areas that the deer use to move from bedding areas to food sources. 3. Plant food plots – Food plots help increase the capacity of how many deer you land can maintain and hold. Without adequate food the deer will only pass through. Plots offer nutrition for the deer when the natural browse is gone. Hunger will cause a deer to move from his home range. Plots will help keep deer on your property and draw some of your neighbors deer. The three main things I find most important when hunting is scent control, scouting, and not taking a shot you’re not completely sure of. 1. Scent control is important due to the fact if a deer can smell you, you will never get a chance to bag that trophy buck. 2. Scouting is another thing I do every season because If you’re going to go hunting you want to hunt in a area that has the game you are looking for. If you don’t scout it is a possibility you will be setting in a tree all day in a area with no deer. 3. As for not taking a shot you’re not sure of this is something everyone should know. You want to take a animal with a good clean ethical shot, not one that could just injure the animal. It makes you look like a better hunter by not injuring a animal on a shot you never should of took. My tips have to do with minimizing what I refer to as your human signature. These are the things that provide for a deer’s seemingly mystic ability to bust us at the least opportune moment. They are comprised of the 3 S’s Scent, stealth and structure. This may seem rather basic but year after year ignoring them costs hunters opportunity’s. 1. Scent is simple, clean every part of yourself and equipment with a good quality odor eliminator. There are numerous products on the market today that will serve as a solution to this part of the equation. Hunting the wind is paramount. Exercise discipline and don’t hunt a particular stand until the wind is right for it. 2. The stealth component can be handled by staging a mock hunt in your back yard. Use all the equipment you will employ on a real hunt. Testing your equipment will effectively reveal any cracks, clicks, or metallic squeaks from your gear that could prove disastrous in the deer woods. This is also the time to listen to rustling or binding of clothing when drawing your bow or shouldering your firearm. 3. When I say structure, I am referring to your physical structure, i.e. camo and concealment. This in the most rudimentary of terms is the process of obscuring one’s outline. It’s not difficult to achieve but its important should not be understated. Research shows white tails see quite well in the ultra violet spectrum but not so well in the infrared spectrum. Do not be concerned in your area you are required to wear blaze orange. Simply use good camouflage technics such as wearing camo patterns that blend well with your environment, ensure you have a good back drop and brush in foreground. Lastly sit still! A phrase I use frequently when speaking at seminars is “paying attention to minute details will serve you well”. 1. Cover scent is the first and foremost important tip in being a successful hunter,you can only fool the whitetails nose for a limited time before your winded, and then your hunt is over.This is why I use Jackies Deer Lures cover scent. I prefer the “No Scent plus Earth Cover Scent” because whitetails are curious animals and fresh earth scent is natural to them. 2. Scouting is “Very Important”. Know your land, your habitat surroundings, where the deer feed, their bedding areas, along with their travel corridors. By putting all these together will give you an idea where to place your tree stand. Always hunt downwind from bedding areas. 3. Deer Lures and scents are another “Very Important Tip”. Whitetails identify each other by smell. By placing the smell of another whitetail in their area, this will allow any deer to smell your setup and come to investigate. I use Jackies ID #4 it contains interdigital gland and secretions from another deer which allows the deer to track one another.Whitetail bucks mark their territories with scrapes and rubs,I make mock scrapes using Jackies Mock Scrape Powder, Premium Buck Urine, and Hot Doe in Heat. These are the most commonly used Lures. Based on my experience, the best advice for deer hunting is do the research to find where the deer of the caliber you are targeting live or are moving through. Once you find that general area, do the legwork to get off of the roads beyond the masses and find the particular spots that the deer frequent, when they spend time there and why. If it is a migration hunt, you will need to spend a season or even multiple seasons learning where the travel corridors off and where to set up to intercept. Finding that great spot can often be a multiple year project. Once you have settled in on a location, try to impact it as little as possible. This can be done by glassing from a distance or just being smart about your entrance and exit from the are and playing the wind. The last thing is to be persistent. If you’ve done a good job finding a spot, and haven’t impacted it too much, it’s just a matter of time and patience. Be there early, stay late and work hard. Success will come. These are the most basic tips in my opinion and based on my experience whitetail hunting. You have to play the wind most importantly. It doesn’t matter what other factors are in your favor, if the deer catches your scent prior to getting into range, it’s over. You have to be patient. This applies to limiting your time checking trail cameras, disturbing your hunting spots, waiting for the perfect conditions to choose the stand you’re going to hunt, as well as waiting for the perfect shot to present itself. Lastly, be prepared. You need to have the right tools and the practice, practice, practice. A hunt rarely goes exactly as expected so being able to react in the moment is crucial. The absolute #1 tip for bowhunters is to strive for a scent control regiment that eliminates the need to “hunt the wind”. For centuries hunters have taken animals that relied on their sense of smell by simply hunting downwind of where they expected opportunities. However it’s an undisputed fact that deer oftentimes travel unexpected routes that put them downwind and ruin the best of plans. I perfected a scent control regiment 17 years ago and have deer downwind of me on a regular basis and due to my total scent control regiment, never get winded. Because odor is something we can’t see or touch, it’s easy for hunting companies to baffle us with false rhetoric and the downside is there are no federal agencies policing their legitimacy. Over my 50 plus years of experience in trying every new scent preventive product that came along, the only system I’ve ever used that worked to perfection was a properly cared for and properly stored Scent Lok jacket, pants, headcover with drop down facemask, and gloves used in conjunction with a clean pair of rubber or neoprene knee high boots and a frequently washed in scent free detergent pack. Humans are constantly emitting body odor in the form of gaseous and liquid molecules and a properly cared for Scent Lok Carbon Alloy® lined complete covering system will adsorb 96 to 99% of those odor molecules keeping your human odor signature so minimal that scent detection will be a thing of the past. That odor adsorption fact has been proven in a United States District Court. Most hunters scout and prepare locations during pre-season and mature bucks don’t have the thought process to differentiate between us scouting and hunting and simply react to the sudden influx of human activity by avoiding the area or most often, turning nocturnal. Over molestation of an area during pre-season can totally shut down all daytime activity by mature bucks outside their secure bedding zones, negating any chance of early season successes. Since well over half of the Pope & Young entries are taken during the rut phases, most scouting and location preparation should be done during post-season while looking at sign left from the previous rut such as scrape areas, licking branches, rub-lines or clusters, converging runways, etc. Once finished, get out and stay out until you return during season with bow in hand. During post-season you can scout as often and prepare as many trees as you want without fear of altering fall movement patterns. The surrounding area and trees during the rut phases will also look similar to what you are looking at, indicating how much concealment cover your set-ups will offer at crunch time. Hunting rut phase locations prior to the rut phases is a huge mistake because your intrusions and presence will alter the doe traffic at the location during a time when mature bucks are primarily nocturnal. Then when mature buck testosterone levels rise to the point that they begin pursuing estrus does during daylight hours, the doe traffic you altered away from your location is what they will be pursuing. In heavily pressured areas realistic chances at mature bucks early in the season and prior to the rut phases are extremely slim, but if you must hunt, have secondary locations where your entries, exits, and on-stand time will not affect general deer traffic at your rut phase hunting locations. Since all buck traffic during the rut phases revolves around doe traffic, rut phase locations should be left totally alone until then, so the doe traffic at them is not altered. 1. Do all your scouting in March and April. It gets you off the couch and in the woods early. At some point after the deer season, everything froze in time. When early spring arrives, everything appears as it did at the end of the rut. The shavings are still there under the rubs. The scrapes look like they were made yesterday. Guess what if that buck wasn’t shot that previous year he will be back and he will be bigger. Use this information to set up for the following year. Get your stands in and clear your shooting lanes. There are no bugs, you don’t sweat your tail off. Set up your trail cams and leave them until you can’t take it anymore. Come first day of bow season, That buck will have no idea he is being hunted. Huge advantage. 2. Since Deer behave differently during the 3 phases of the rut, don’t be afraid to hunt them differently. Remember that the rut is a gradual progression. Testosterone is slowly increasing in the bucks and Estrogen is increasing in the does. Understanding this will help you anticipate what the bucks are doing. During the Pre Rut bucks make scrapes and wait on the does so scrape hunting can be very effective. Peak Rut the bucks are chasing the does, so were the girls are the boys will be. Post Rut, Bucks have lost 20% of their body weight and will need to refuel. They will be where there is food, southern exposure and does coming in to the secondary rut cycle. When making mock scrapes, buck urine is your best deer lure early in the season. If 3 bucks are on 50 acres. Let say a 4 , 6 and 8 pointer. They typically are in bachelor groups They all know each other very well through sight and smell. Introducing another buck into the mix is an absolutely deadly technique. 3. Lastly, Always save venison from the previous year as you may need it to go with your humble pie. Please visit our web-site at www.team-northwoods.com. First, any day deer hunting anywhere is better than any day anywhere else. Meaning don’t let weather or life get in the way. If time is limited go anyhow. I have seen more success on days I never would have dreamed would work than days where everything was perfect. Second, never think that the only way you can kill a deer is by doing what we see on TV. You don’t have to have a big track of land or know every deer by name. don’t get me wrong, I am like every other deer hunter and I too dream of someday killing a giant deer, but I guess with my age I am cherishing other things than just the size of the antlers. Deer hunting is more than killing the biggest, it’s more about the sights the sounds, the ones that get away, and the people we share all of this with, those are the memories and the stories we will tell later in life..
Third, carry a call and antlers all year long. When the season opens, until it closes you will always find a grunt call and a set of antlers in my pack. I have rattled and grunted deer in several states during every month of the season. I am not a biologist and i don’t speak deer, so I can’t tell you what I am saying or what the deer are thinking, but they seem to be interested in me talking to them at any time. Varying your aggression and volume does play a factor, so take their temperature before you freak out.. Trust me don’t be afraid to get out of the box, amazing what we find outside that box. 1. If you’re hunting on public land, get away from other hunters. This includes access points such as roads and trailheads. Luckily, you don’t need to go too far, especially if the terrain is rough. Usually, if you’re at least half-mile to a mile away from a road, then you probably won’t see another soul. The deer quickly learn where the areas are that are easily accessed by hunters and will start to avoid those areas during daylight hours soon after the season starts. If you’re where the other hunters aren’t, there is a good chance that you’ll have some great hunting. 2. Consider hunting during a primitive weapon season, particularly if that season occurs before the general rifle season in your state. Hunting during bow season is a good way of doing this, but don’t forget about muzzleloader season (if your state has one). There are usually even fewer muzzleloader hunters than bow hunters and that season is a great opportunity to have some time in the woods while the hunting pressure is really low. 3. Especially if you’re hunting mature bucks, hunting for a fewer number of days that are all during prime conditions will probably give you a better shot at killing a big buck than by hunting more often during varying conditions. Those deer get big by being smart and you’ll only have a few opportunities to get him until he wises up. For that reason, resist the urge to hunt that prime stand until the weather and wind conditions are perfect, ideally during the pre-rut or rut portion of the season. 1. Sit still and be patient – When hunting Blacktail deer, my best piece of advice is to find travel lanes, bedding locations, scrape lines and vantage points that allow you to see a lot of country and to sit still, glass and wait. Your best bet in connecting with a Blacktail deer is to be undetected by them and that’s hard to do when you are moving. 2. Don’t leave a deer unattended in bear country – In many places in Alaska, bears associate rifle fire with a downed animal. Don’t leave your deer unattended, or it might be dinner for a bear. 3. If a deer runs away, stay calm and keep the animal in your sights – In many cases, a deer will bound away when it detects you. However, in many cases the deer will stop and look back after it’s initial run. That gives experienced hunters a second chance. Marcus Weiner is Publisher of Hunt Alaska magazine and Fish Alaska Magazine. 1. Patience. Patience is key when Whitetail hunting. Learning to sit and walking in nature. Observing. Seeing. Listening. Moving according to the situation. Making mistakes that you wont repeat next time. All these skills bring success in a harvest. But also bring success in life. 2. Harvest mature Deer. Pay attention to sway back. Pot belly. Big neck. I believe when you harvest a mature Whitetail you will not be disappointed. A mature Whitetail is a great Harvest anyone can be proud of. 3. Do not hunt score. Hunt for the love of hunting. Hunt because you love to be in Nature. Because being in nature brings peace and joy. I personally love guiding Clients, and love to see their joy when they harvest a mature Whitetail. Nothing brings me more joy then being part of A adventure of a lifetime for a client. After having pursued wily trophy whitetails in the fabled peaks of Central Canada for more than 35 years, I have picked-up a few tricks and observations along the way. Understanding big buck behavior, under pressure, has often been my key to success; especially when hunting Crown land. One behavior I have noticed over the years is that mature bucks can, and will, use water as a means of escape. Though not considered a highly aquatic animal, white-tailed deer are good swimmers and have no trouble jumping into a lake or river to evade hunters and predators. I have seen it and capitalize on it, many times over the years. The Quebec record typical I harvested in fall of 1996, for example, had just swam the end of a lake to avoid hunters; when I caught its movement out of the corner of my eye. The water factor is something I consider in every hunt now and have seen many trophy bucks use this same tactic to slip away and out of sight! Do not discount that river, lake or reservoir on your hunt territory as a possible travel corridor and it makes no difference if you hunt the swamps of Georgia, or a lake in the Canadian Shield! For me, studying and understanding pre-season whitetail patterns is of utmost importance! After having pursued one particular trophy buck I appropriately called ‘Ghost Buck’ for six seasons; I learned a few aspects of big buck behavior. 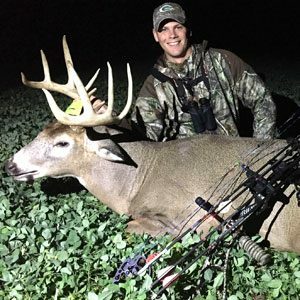 Monitoring trophy whitetail habits in the off-season will not necessarily guarantee you will connect during the season, but it does provide insight into whitetail behavior. With a series of trail cameras set-up at key travel locations: bottle-necks, escape runways, trails leading to and from feeding/bedding areas, you will have a greater appreciation for your buck’s home territory and how he moves on a daily basis. I begin my pre-rut scouting in late September with hopes of ‘patterning’ a big buck by the time rifle season rolls around in November. Several thousand trail cam images later, and you will begin to see what makes your trophy buck tick and what areas he frequents. Part of my success over the years has been the ability to find quiet areas with low hunting pressure. Having hunted mainly Crown land the majority of my career, finding spots other hunters tend to avoid has really paid off. We call these ‘quiet corners’, which are basically section of bush off the beaten path; perhaps too dense or dirty for the average hunter to attempt entry. I have hunted the same quiet corners year after year and notice that as the deer season progresses, these areas tend to become buck holding areas. Look for long peninsulas of land jutting out into a lake or even a large isolated island. Swamps, cedar swails and bogs all have the potential to be quiet corners throughout most of the year. You can also locate a quiet corner with the help of a topographic map or handheld GPS. Once a potential corner has been identified, do your home and scout these areas prior to the season. With a bit of leg-work you too will discover your own quiet corner in which to pursue that buck of a lifetime! 1. Choose Your Times Wisely – I’ve heard people say, “you can’t kill ’em from the couch”. While that’s true, when it comes to hunting mature Whitetails, you also can’t kill them by hunting every day in the same stands and over-pressuring your area. Choose days when the wind and weather is right and helps put the odds in your favor. 2. Get Crazy About Scent Control – Some have said my scent control regimen is a little “crazy”. Maybe they’re right, but I also tend to see a lot more deer in the woods then they do. Am I just lucky? I don’t think so. I think attention to every little detail matters and there are a ton of little details to consider when it comes to scent control. So get obsessive about scent control. I bet It’ll pay off. 3. Keep a Journal and Review It Annually – People often talk about patterning deer during the season, but I believe you can also pattern deer activity from year-to-year. That was the reason I originally create ProHuntersJournal.com – to create a tool that would make it easier for myself and others to keep a journal and record important data about their hunts. Looking back at past journals helps me plan future hunts. 1. Know the environment you are hunting in and tailor your techniques and tactics. Hunting techniques and tactics vary depending on where you hunt. I’ve stalked deer with a bow in the Midwest by simply walking through a block of woods that was full of deer; the same technique would not work when hunting bucks in the big, open tracts of woods in the northern part of the state of Maine. 2. High-tech gear can be useful, but deer hunters must have a solid knowledge of woodsmanship through actual experience in the field. Beginners and experienced alike can gain useful hunting knowledge from schools like Hal Blood’s deer hunting classes in the Northwoods of Maine (bigwoodsbucks.com). Take the classes and attend seminars and then take that knowledge out into the field and actually practice it in the woods. 3. Too many hunters don’t spend enough time shooting at the range. Successful hunters have to be good shots — seems like a no-brainer, but a lot of hunters go out a few weeks before hunting season and sight their rifles in and consider that a good shooting session. The best shooting practice starts when the hunter gets his weapon-of-choice off the bench and takes the training to a new level by simulating shooting situations that often take place under hunting conditions. 1. Taking scent control seriously is a must. There’s no better way to alert the deer in your area and cause them to begin taking other routes than by spreading your scent around. Scent control contains 3 steps: clothes, body, field. Wash your hunting clothes in odorless laundry detergent and store them in a setting free of human and other odors, such as a Scent-Safe™ bag. Shower with odorless body soap and shampoo and once in the field, spray down every piece of gear with Scent-A-Way® spray to destroy any spec of scent you may have picked up throughout the process. Don’t forget to spray down your boots, even the bottom. Find the tools you need for each step of the process at http://www.hunterspec.com/scent-a-way. 2. Don’t overhunt a stand. Deer will begin to pick up on your presence if you are in the same stand every week. Rotate stands and only hunt stands when the conditions are right, meaning you have the correct wind direction you are entering the stand during the time of day that you are least likely to bump deer while walking in. 3. Use calls as tools, not as personal entertainment. Some people like to blow a grunt call or use a rattle call simply because they think it’s fun. Calls are meant to be used as tools for the right situation – if you have a buck that is coming to you already, don’t call to him. If you see a buck that is moving away, that is the best time to call since you have nothing to lose. 1) If your goal is to hunt a world class whitetail, then you have to hunt where world class whitetails live. That means travelling for most of us. Where I have lived for the last 30-years, in British Columbia, there are no world class whitetails, so I head to Saskatchewan, Canada every fall. But there are many other provinces and states that would suit. So again, if a world class whitetail is the goal, research where they live and prepare accordingly. 2) If your goal is to hunt for the biggest buck in a given area, your odds of getting that big buck, are directly proportional to how much information you have about that buck. Which means the more Stealth Cameras you have out, the greater your knowledge of what that buck is doing. One trail camera, on one trail, gives you one bit of information about that buck’s habits. But 100 trail cameras on 100 trails, gives you 100 times the knowledge of where and when that buck will be at a given spot. 3) Take and use binoculars every single time you venture into the woods after whitetail deer. Whether you are still-hunting or stand hunting, spotting and stalking or rattling, with a good pair of binoculars, you will be able to see deep into that “impenetrable” forest, far deeper than you can with your unassisted eyeballs, no matter how good your eyesight is. You’ll see tiny shooting lanes and will be well aware of the buck coming long before the buck is aware of you and just as importantly, you’ll know how big the buck is and be ready when it arrives, not using valuable shooting time to judge the buck. I use Leupold 10X50’s, with an adjustable focus knob to search out the shooting lanes. But as I said at the beginning, there is no panacea for taking a big buck and all the “tips” in the world will not overcome the three irrefutable rules to remember when hunting whitetail deer; deer do what they do, deer are where they are and deer move when they move. Which means you don’t need “tips”, you need time. The more time you spend in the woods, the higher the odds of getting a big buck. At Sound Barrier we emphasize the need to defend against the whitetail’s sense of hearing, an often overlooked sense but one that ruins as many (or more) hunts as vision and smell do. For a hunter to really see success, they need to focus on defeating this sense that we call the whitetail’s “last defense.” Here are 3 tips to do that! Whitetail have no tolerance for noise, do you? Every sound, little or big, matters and can literally be the difference between success and failure in a season. Zippers, Velcro, buttons, buckles, clanging metal, clunking plastic, every step, every motion…it all matters. Ask yourself this question: “If what I’m about to do makes noise, what could the consequence be?” If it could be negative in the long or short term in ANY way, change your behavior accordingly, because every sound counts! When we move too fast, we make way to many noises..hunt-busters. As a rule of thumb, doubling the time it normally takes to reach your stand will decrease total noise by half. Take time, notice each step, each motion, plan it out, and take effort on each move making complete silence the goal. If you don’t have time to do this, you probably do not have time to hunt. Do it right, or don’t do it at all. Big bucks rarely get killed by the fool crashing through the woods, and again, even small noises we tolerate, are not by deer. So go slow! With gear you have not eliminated due to the “noise cost,” you need to silence it. What actions can you take to make sure there is NO chance to clang, bang, or clunk it ANY time while in the woods or your hunting area? This is key.. ANY time. IF there is a chance, that is too high a chance. Think about making a noise during the moment of truth, and how you would feel in that moment (and the rest of the year). No action is too extreme to eliminate that chance, especially for the hunter wanting to take stealth to a new level. It is a necessity, not an option to silence all equipment! Several of the most successful hunts I have been on have included some form of preparation prior to the day I made the harvest. Knowing the land you are hunting and the natural paths the deer take are very important. We use trail cameras and good mapping tools (huntwise.com) to identify hot areas for tree stands well before the season starts. It’s important for the deer to feel comfortable and acclimated to your stands several weeks prior to your hunt. Before we built the prediction formulas in the HuntWise app, I had only partially understood what weather conditions affect deer movements. I did not regularly watch the barometric pressure, moon phase, temperature or wind speed. And even when I did watch those variables, I never really understood why certain variables are more important on certain days. Some of these variables, like moon phase, are even hotly debated whether they have any importance at all in predicting deer movement. Nevertheless, I try to spend more time hunting on the days when the pressure is changing, wind is light, the moon phase is approaching the full moon, and the temperature is slightly below the historical average. I love hunting. I love it for many more reasons than just the kill. It’s a time for me to detach and be in God’s country. Some of the best relationships in my life have formed over a mutual love for the outdoors. For these reasons, I can spend hours in the deer stand seeing nothing and come home having had a successful hunt. Hunters know what I mean. If you set your success level at only a trophy class buck, you’re missing out on so much! Know what your prize is and what it isn’t. 1. Don’t overlook small tracts of public land during the rut. Often deer concentrate on private lands but during the rut bucks will be traveling and pushing does to more hidden areas. A big buck can show up on public land at any moment during the rut. 2. Use your optics. Find a good vantage point and pick apart the country with your binos or spotting scope. Don’t be to anxious to move spots if the area looks good and you can see a lot of country. Bug bucks have to stretch at some point and you want to be ready for him. 3. Get ready for the shot. Often times a big buck won’t hang around long when he knows you’re around. Practice taking shots from different positions so you are ready when the opportunity presents itself. Be prepared to make due with any rest you can grab. Scout and stick it out. Personally my biggest downfall is that I put all my time in scouting, find a perfect spot, and then don’t stay long enough to realize the results of all my scouting! Just pick a spot and commit to it! Don’t be afraid to set your stand/blind up in an unusual spot. Just because there is a worn trail doesn’t always mean the big boys use it all the time. This hold true if they are only on game cam at night on those trails. They move during the day too, just off the beaten path. Don’t over hunt an area – You should have multiple hunting spots on the property in which you plan to hunt to allow each area a break in between hunts. Deer can sense hunting pressure; they have excellent sight and hearing and may completely alter their behavior if they sense something might be wrong or dangerous. So even if you’ve seen a deer day after day after day on your camera, once they sense something is wrong…you might not ever see them in daylight hours again. Study study study! Study your area, study the weather, study the moon phase, study your trail cam pictures. If you are hunting public land… study social media sites to see what has been taken and or seen. If there’s a stud in the area, no one will be able to keep their mouth shut! Don’t set your blinds or stands to close to their trail. Keep it back about 30/40 yards. Around here the mosquitoes are the size of birds just about lol so my tip is to make sure you bring any repellent you may need and wear clothing that you know will keep the pests away. I have scared away quite a few deer because I was either slapping mosquitoes, swatting flies or scratching a bite. Make sure you are 100% prepared for your hunt! When aiming at your target, breathe in then shoot on the exhale! Works for me, makes my hand more steady both with a bow or gun. Prepare! That means scouting before the season begins, to find a good hunting spot. It also means be prepared to sit or walk for long periods of time, deer are not predictable, especially during the rut. I always have my backpack filled with necessities, such as cellphone, flashlight, game calls, thermacell, bottled water, snacks, extra ammo, maps, license, ink pen, game tags etc. Having your necessary items all in one backpack is much easier than trying to explain to a game warden that you forgot your tags on the kitchen table. TIP: keep in mind, deer, can hear you, see you, smell you; plan accordingly! Always tell somewhere where you’re going, and how long you plan on being there. I always tell myself to layer layer layer because I’m cold natured and will get chilly which in turn makes me miserable. And I always have gloves and socks (most of the time 2 pair) , Raynaud’s is aggravating! “Sshhhh… There be deers in deez woods” – my dad. There are tons of great deer hunting tips to take away from this post – a whopping 10 000+ words of content from 50 amazing experts. If you know anyone that could benefit from these advices here, don’t hesitate to share it with them. Also, I am pretty sure that there are some experienced hunters reading this post and I have the same question for you, what are your 3 best deer hunting tips you can share based on your experience? See you in the comment area below!